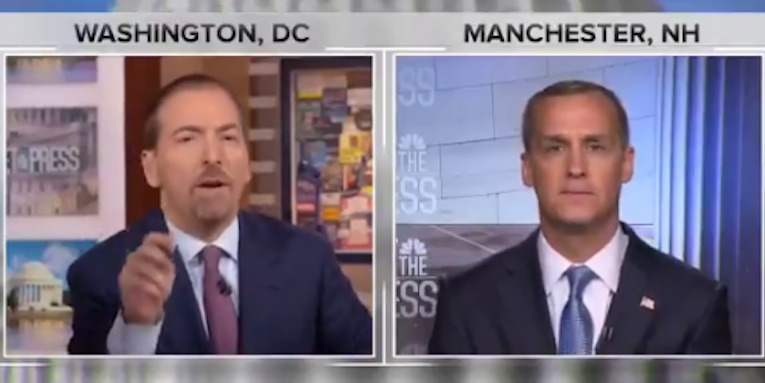 Former campaign manager for President Donald Trump Corey Lewandowski told Chuck Todd on “Meet the Press” that he rebuffed Cambridge Analytica three times. He also said he had been aware of former White House chief strategist Steve Bannon’s ties to the data mining company, but that it had no impact on his decision. Cambridge Analytica has been embroiled in a wide-ranging scandal about its data mining operations during the 2016 elections. Former campaign manager for President Donald Trump, Corey Lewandowski, distanced himself from Cambridge Analytica on Sunday in the wake of a series of stunning revelations about the data mining firm’s work with Facebook, the Trump campaign, and the behaviour of its leadership. Lewandowski said on “Meet the Press” that the Trump campaign never hired them during his time as its manager, which spanned from January 2015 to June 2016. Lewandowski added that he was aware that former White House chief strategist Steve Bannon had a stake in the company, but that it had no bearing on his decision. Despite Bannon’s denials, company whistleblower Christopher Wylie said Bannon was reportedly aware of some of the group’s activities relating to the 2016 election. Cambridge Analytica gained international rebuke over the past week due to revelations that the company harvested the Facebook data of 50 million people, for the most part without their permission. The group then reportedly used this data to create targeted ads for the Trump campaign during the 2016 election. In addition, the company’s CEO Alexander Nix stepped down after a Channel 4 News undercover investigation in the company’s native UK showed him boasting about the company’s use of prostitutes and bribe money to put politicians in compromising situations. The company worked with the Trump campaign in its final months leading up to the November election.